My adventures in car camping days began a few years ago . While paddling on a local lake, I encountered a friend paddling with other people from the Albany area. I was all ears when they told stories about their camping excursions, and consequently they invited me to join them. I did a couple of nights with them that summer with borrowed equipment. Now with my own equipment I camp with them four or five times a summer at various New York state campsites. In October of each year they get together to decide campgrounds they want to book; I just go with the flow! A new one, Lake Durant, was one of areas selected this summer due to the paddling opportunities. This is a work day: Unpacking, assembling our tents, blowing up our air mattresses, and organizing our belongings. It takes two of us to erect the screen house where we store our cooking utensils, dishes, and pots and pans. The fun begins at our dinner — appetizer night! We share apps and ideas for the days ahead. None of us had paddled Lake Durant, and since we didn't want to re-load our kayaks and drive, it was the unamious choice. Water access was a bit mucky at our site, so Cathy launched at a nearby vacant site and I choose to put in at our site, while Pam and Peggy launched their kayaks at the Durant boat launch. We paddled west; for awhile we could see Route 28 and the old Route 28, which was practically on the edge of the lake. When I drove by this area I always had a desire to paddle Lake Durant and wondered if I could launch from the old road — you can! There are a few islands and a beautiful rock peninsula; there are no structures. We came to a footbridge which separates Durant from Rock Pond. Since there was no way under it, and being that Rock Pond is small, we decided not to do a portage. However, I did get out to take some photos of the boardwalk. Once back at the campsites, Peggy suggested ice cream. We headed to Blue Mountain Lake to find the ice cream sign she spotted — she never misses an ice cream sign! The sign stated bait and ice cream so we were a bit skeptical, but relieved when we saw the ice cream shop was in a separate building. 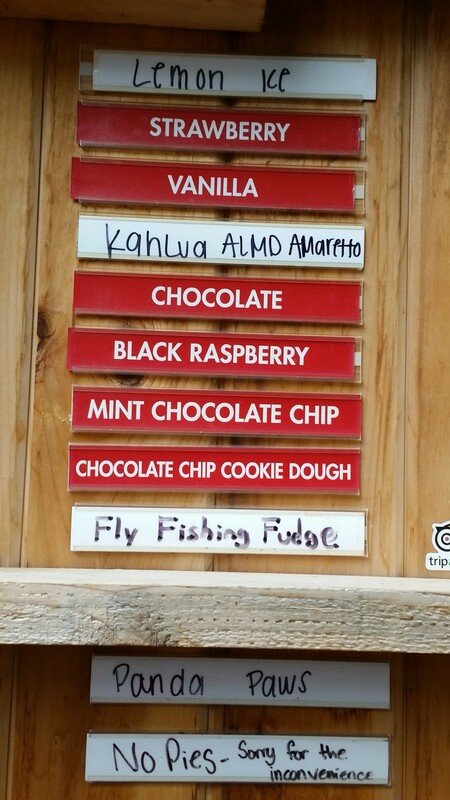 The Blue Mountain Lake Boat Livery has it all — bait, boats to rent, ice cream, and even pies! The ice cream was delicious, of course! We took a short walk to the Adirondack Lakes Center for the Arts, where they display the creations of local artists, have classes, and hold concerts and other special events. Prior to heading back to camp we drove to Blue Mountain Designs, which was an old schoolhouse that is now it is filled with gifts, antiques, and crafts. South Pond was recommended by a friend. We found the access between Blue Mountain Lake and Long Lake on Route 28N/30. The pull off looks like a rest area on the left, the trail is just beyond the rest area, near a reflector. We knew the trail was steep because we checked it out prior to unloading. With a lightweight boat it would have been fine, but with our 32 pound kayaks, we elected to abandon that trip. We instead headed to Blue Mountain Lake to paddle from Blue Lake to Eagle Lake to Utowanna Lake. The launch site is to the right of the beach and it's flat and easy. Our outing was cut short due to the sound of thunder — we pulled out, ate our lunch, and wondered if the leftover cucumber and bag of chips would hold us ove. Luckily the thunder stopped, and with the sky still gray we headed back to the launch site. This day started with rain and scattered showers were predicted for the remainder of the day, so a Camp Sagamore tour was our choice. On the two-hour tour we learned the history of this camp. There is a lot of history and we saw the beautiful buildings, which included cottages, a schoolhouse, blacksmith shop, a barn, and an indoor/outdoor bowling alley! 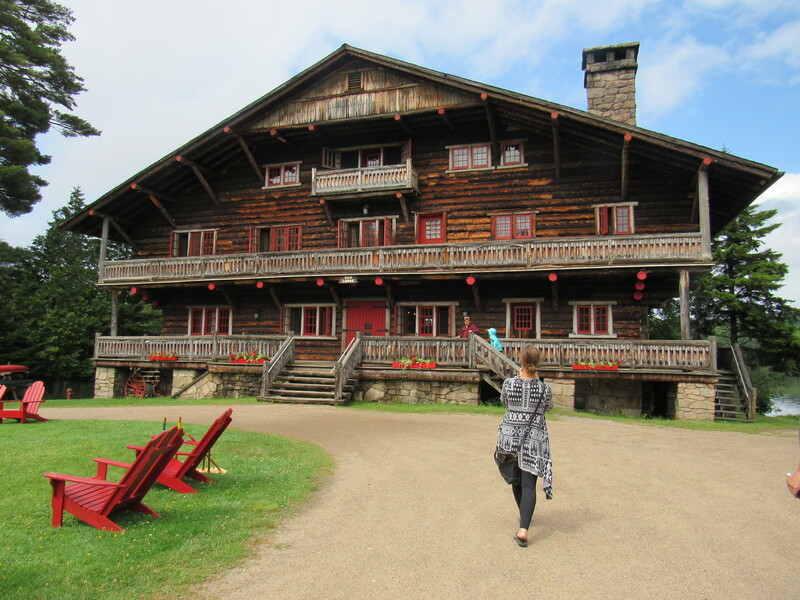 However, the main lodge on the pristine lake was my favorite. 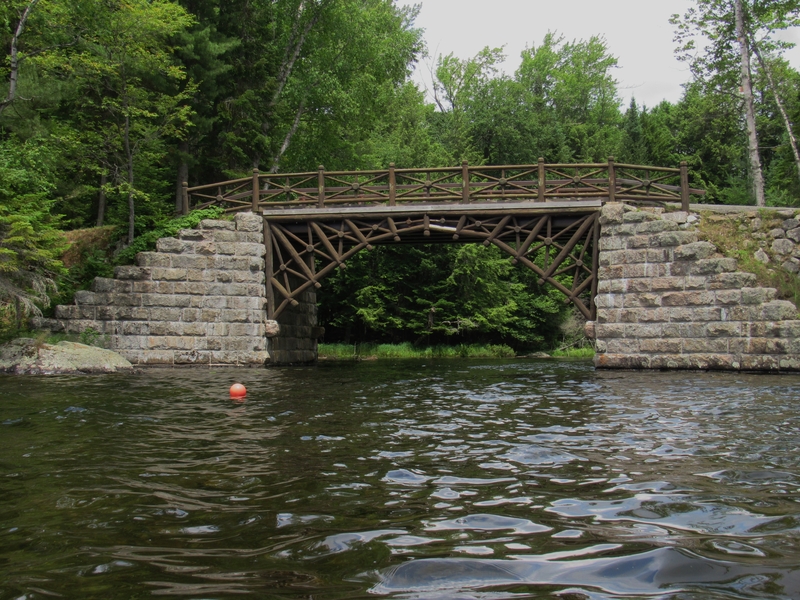 In order to paddle Lake Sagamore you need to be a guest — now that is on my bucket list! 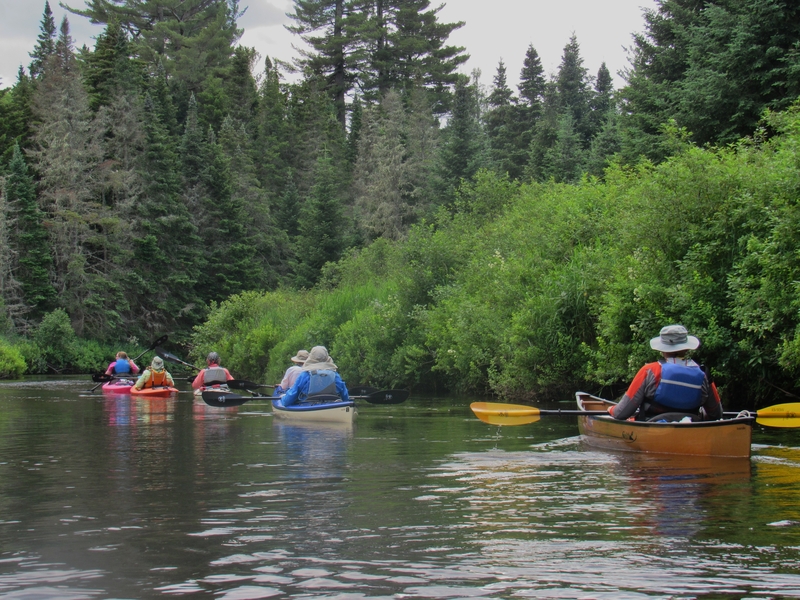 We were all anxious to paddle Cedar River Flow, so with only a 10 percent chance of rain on Sunday, five campers and two other friends who traveled from Albany set out for the projected six-hour paddle. The launch site, outside of Indian Lake, is on Cedar River Road. The lake was choppy, so everyone had to pay attention so they did not go broach. Once on the river it was easier. A beaver dam was a problem for one paddler, due to the current and the dam, but Ellen exited her kayak and pulled her through. Luckily, Ellen was wearing muck boots! At the lean-to, which is on the Northville Placid Trail, we devoured our lunches. After lunch, we paddled another half mile to the rapids. Dinner at the Indian Lake Restaurant was a great way to end the outing, although the two of us needed an ice cream fix at the gas station, a convenience store on the corner of Route 28 and 30. Since we hadn't made it to the Utowanna on the third day, we launched a few miles outside of Blue Mountain Lake, on the right just before the Utowanna Lake sign at a pull off. The hill to the water was doable with two people handling each kayak. We paddled to the portage to the Marion River then back toward our launch site, and found the lean-to almost opposite our launch site, a pecfect location for lunch. We had a nice view of the lake and some wild orchids growing on a log in the water added to the beauty. After lunch we headed to Blue Mountain Lake. It was choppy crossing Eagle, but even worse on the way back. We stuck together for that workout! On the way back to camp, two of us visted the corner store for — yes, you guessed it — ice cream again! Cathy and I were the only campers left, and with rain in the forecast we visited the Adirondack Experience, The Museum on Blue Mountain Lake. We both wanted to see the new exhibit, Life in the Adirondacks. We selected our favorite region in the Adirondacks, had our photo taken, and watched it float to our location on the large overhead map. We paddled a guideboat and visited the other galleries — there are 24 galleries and historic buildings! Lunch in the cafe' was delicious, and the view of Blue Mountain Lake was breathtaking! On the way out we shopped in the gift store. I purchased a lace table cloth, 50 percent off! That evening we disassembled the screen tent, leaving some items on the picnic table covered with a tarp in case of rain, then relaxed in our camp chairs and enjoyed the neighbor's campfire from afar as we were out of wood! On our last day we lucked out — no rain! Packing up in the rain is difficult and everything is wet and dirty, therefore double the work when you get home. Needless to say, we also enjoyed the normal camping perks of campfires and sunsets! 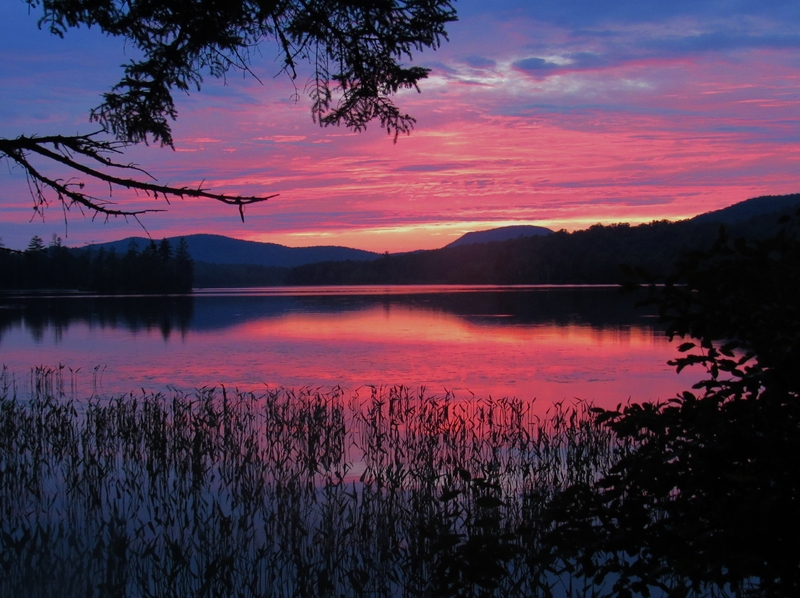 Spend a week in the Adirondacks, you won't be disappointed! 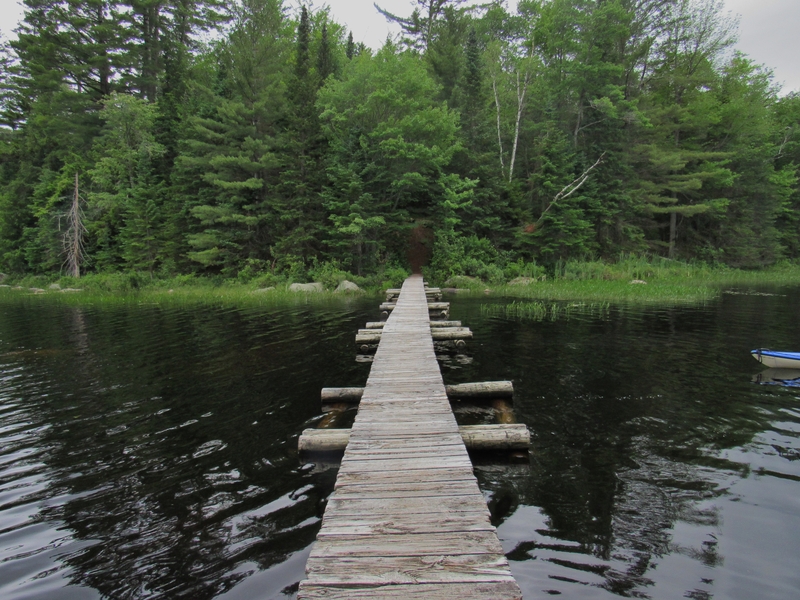 There are plenty of campgrounds, paddles, and historic sites to choose from!